Remember The Great Dane? No, not the dog. Victor Borge, the Danish pianist who combined his piano prowess with a comedic delivery that both wowed audiences and had them rolling in the aisles with laughter. 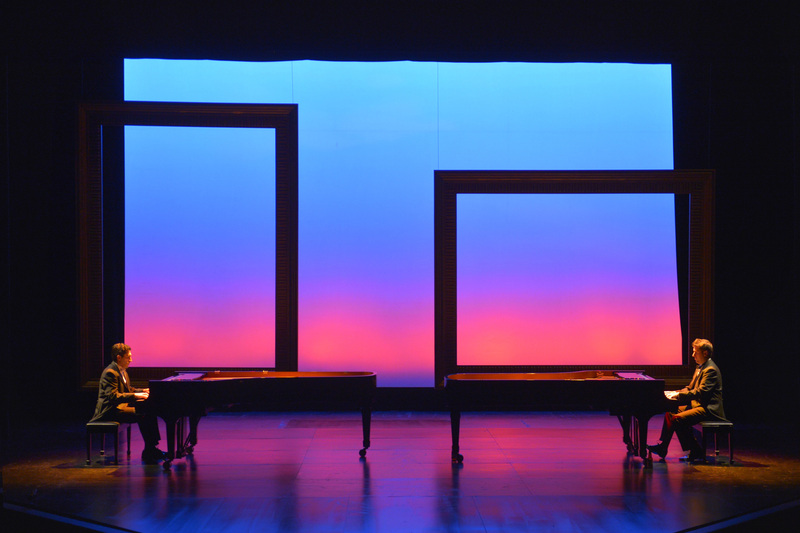 2 Pianos 4 Hands, the current production at TheatreWorks, contains much of the same musical and comic genius that made Borge famous, particularly the opening as the two actor/pianists clad in concert tails take the stage in front of two grand pianos. What follows seems like two Borges for a while, but they are not. They are Darren Dunstan and Christopher Tocco portraying the co-authors of the play, Ted Dykstra and Richard Greenblatt. Well, in this case, it’s fair to say that Dunstan and Tocco literally “play” Ted and Richard given how much music they make during their performances, and they are guaranteed to delight audiences throughout the run. 2 Pianos 4 Hands is a semi-autobiographical play that chronicles young Ted and Richard as they make their way through childhood and early adulthood striving to become world famous solo pianists. Although the real Ted and Richard didn’t actually meet as boys, the play they created depicts them as childhood friends and rivals winding their way along the path to what they hope will be eventual greatness. Their experiences growing up with pushy parents and tenacious teachers provided them with a wealth of material to draw upon. 2 Pianos 4 Hands will strike a chord if you have ever tried to excel at any endeavor that required dedication to master a skill such as playing a musical instrument, or wielding a tennis racquet. The play isn’t technically a musical, but there is a large portion of music served, giving the audience a classy concert in the midst of brilliant comedy as art imitates life. Tom Frey directs this production, but this isn’t the first time he’s been involved with the show. Having played almost 800 performances and directing 13 previous productions, Frey understands all of the nuances of the script and has dealt with his piano demons. For a performer, this show presents a daunting challenge. First, both actors must be pianists of the highest caliber conquering several demanding classical masterpieces from the likes of Bach, Beethoven, Mozart, Chopin, and others. Mixed in with that are some popular and jazz favorites that will be instantly recognizable by many in the house. Finally, the pianists must play several exercises with great style as both solo and two piano counterpoint pieces, and that’s only the musical part of the play. As actors, the two-man cast must embody not only their credited roles as Ted and Richard. They must be able to shift instantaneously into other influential personas in Ted and Richard’s lives such as their parents, teachers, competition judges, faculty members, and so forth. Dunstan and Tocco make it look easy, though it is not. There are just a few unplanned missed notes, but given the repertoire, they can be forgiven. Both actors are consummate musicians who, like Borge, get interrupted at times, so they don’t necessarily finish all of the pieces. The music is punctuated by snappy dialogue, much of it very funny. Their witty repartee is rapid fire, and there’s a wonderful opportunity to even learn a bit of music theory along the way. Several times throughout the performance, Dunstan and Tocco duel, sometimes in words, sometimes in music, but always with a flourish. Scenic and lighting designer Steve Lucas is also no newcomer to the show having been involved for the last 18 years. His single set showcases two beautiful grand pianos facing one another front and center. Two large picture frames hang upstage of them, through which various effects such as ornate windows, interesting shadows, or flames, greatly enhance the experience. His lighting design beautifully focuses audience attention and complements the mood. Whether you’re a musician, a sportsman, or in pursuit of excellence in some other field, this is a must-see production. Its comic genius and virtuoso musicianship will enthrall and inspire you to pursue your dreams. See http://www.theatreworks.org/shows/1415-season/2pianos4hands, email boxoffice@theatreworks.org, or call (650)463-1960 for more information or to order tickets.